2583-7394 Features: -Reinforced tooth for increased durability when cutting through nails and other foreign objects.-+6 hook angle for fast, aggressive cuts.-Anti-stick coating minimizes friction and gum-up.-Raker tooth design keeps the blade in the cut thereby minimizing vibration.-Taper back bi-metal reciprocating blade for fast wood cutting.-5/8 tpi.-5 per card. Dimensions: -12'' length. 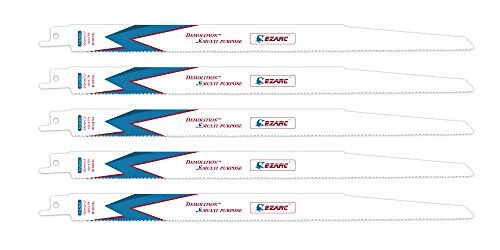 Product DescriptionEZARC R1225DG with progressor teeth design of 10/14TPI makes this blade suitable for both thin and thick-walled materials include metal, wood, FRP, composition materialBlade Material: Bi-Metal with 8% CobaltTeeth Per Inch: 10/14TPITotal Length: 300mm/12''Blade thickness: 1.3mmCutting Length: 250mmCutting material: Medium-thick sheet metals (2 to 10mm), metal pipes/profiles (dia. 30134 Features: -Made from premium steel, precision filed and set for maximum cutting performance. -Fits all reciprocating saws using 1/2'' universal shank. -Performs all kinds of general wood sawing jobs. 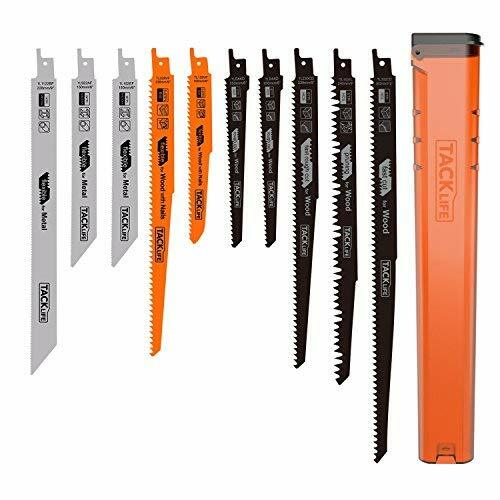 -Hardened carbon steel blades for long life. Unit Material: -Steel. Use Material: -Wood. Product Type: -Adapters & Extensions. Use: -Cut Out Tools. Generic Dimensions: -12'' length. Dimensions: Overall Product Weight: -0.11 Pounds. *** (This item sold as a pack of 25) ***Tough, flexible steel back and Matrix II steel with 8% cobalt cutting edge give maximum durability. Angled shank for faster cutting. 1 2'' universal shank. Bulk. No. 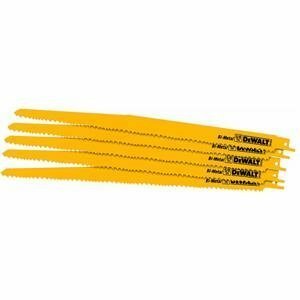 DW4802B25: 6'', 6TPI, general purpose blade for fast cutting wood and fiberglass, , Mesquite. No. 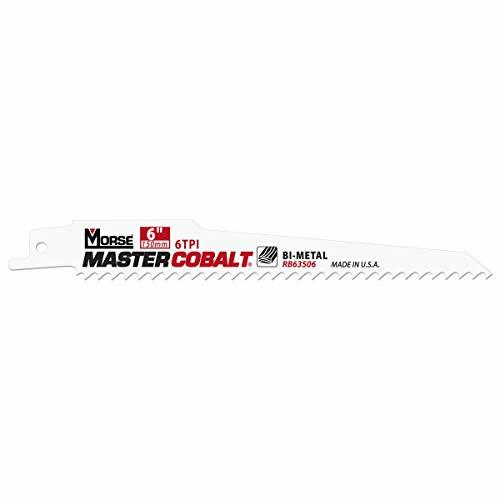 DW4803B25: 9'', 6TPI, general purpose blade for fast cutting in wood and fiberglass, , Mesquite. No. DW4804B25: 12'', 6TPI, general purpose blade for fast cutting wood, . No. 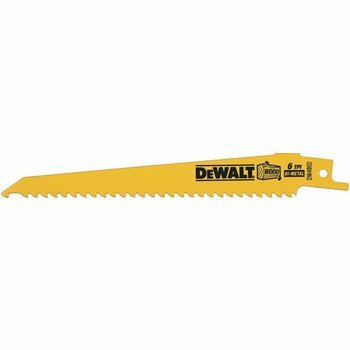 DW4806B25: 6'', 10TPI, for cutting nail embedded wood, composition, cast aluminum, plastics, light gauge metals, and fiberglass, , Mesquite. No. DW4807B25: 4'', 14TPI, for cutting heavy gauge metal, hard rubber, fiberglass, and angle iron, . No. DW4808B25: 6'', 14TPI, for cutting heavy gauge metal, hard rubber, and fiberglass, , Mesquite. No. DW4809B25: 8'', 14TPI, for cutting heavy gauge metal, hard rubber, and fiberglass, , Mesquite. No. DW4811B25: 6'', 18TPI, for cutting mild steel, galvanized, and aluminum pipe, , Mesquite. No. DW4813B25: 6'', 24TPI, for cutting metal trim, conduit, and tubing, . 2583-6347 Features: -For demolition work in wood, nail-embedded wood, and metal. -For fire and rescue work. -6 tpi. -.062'' thick. Product Type: -Recip. Generic Dimensions: -7/8'' width. -12'' length. Dimensions: Overall Length - End to End: -0.38 Inches. Overall Height - Top to Bottom: -2 Inches. Overall Product Weight: -0.36 Pounds. Looking for more 12' Reciprocating Blade similar ideas? Try to explore these searches: Aaaa Earrings, Blue Necklace And Earring Set, and Big Chipboard. Look at latest related video about 12' Reciprocating Blade. Shopwizion.com is the smartest way for online shopping: compare prices of leading online shops for best deals around the web. Don't miss TOP 12' Reciprocating Blade deals, updated daily.